QB PASS RUSH NET - Rae Crowther Co.Rae Crowther Co. 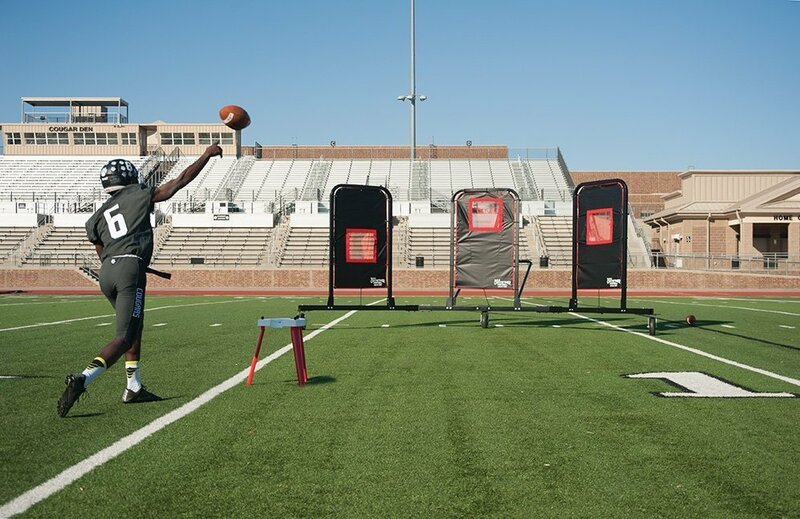 The QB Pass Rush Net is designed to enhance a QB’s footwork, pocket pressure, pocket vision, throwing accuracy, ball trajectory…and a lot more. The QB Pass Rush Net was designed by former Univ. of Miami star QB Ken Dorsey. Ken is currently an NFL Quarterback coach. 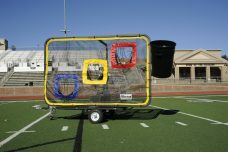 The QB Pass Rush Net is a QB training sled with two distinct functions. 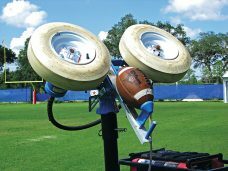 Its first function is in enhancing QB’s abilities to throw accurately with pocket pressure. The QB Pass Rush Net is on wheels. The sled has 3 targets set in an arc. 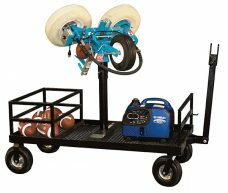 The coach uses the push bar at the center of the sled to push the sled at the QB. The moving sled simulates rushing defenders. The caster wheel at the center of the sled allows the sled to move at any angle. The coach can simulate pressure coming from the middle, left, or right. Work from the shotgun or work from under center. 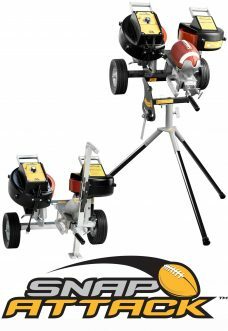 The QB and coach can work on any drop steps and route patterns, and then create the pressure and timing necessary to succeed at those routes. The 3 large targets disrupt the QB’s vision and throwing lanes. The targets are 7’ tall x 3’ wide and thus simulate rushing defenders. The QB must throw over, between, or around the targets. The second function of the QB Pass Rush Net is as a throwing net. Each target has a distinctive pocket sewn into the vinyl. Each pocket is sewn at a different height. Multiple QBs can throw at the pockets while the sled is stationary, or even perhaps as it is being moved. Each of the 3 targets are on different angles so the QB also gets a feel for the receiver at an angle. Each target net is sewn with heavy red webbing to take the abuse of high velocity throws (or nice touch throws, it’s whatever you want to work on). One sled with two roles. Why not make the QB Pass Rush Net part of your training progression and help your QBs succeed? It’s affordable, it’s durable, it’s versatile. The 3 wheels are no-flat foam filled wheels. Total sled width is 17’. The sled is painted matte black. Warranty 2 years. Ships motor freight. Order a QB Pass Rush Net and receive a free QB Bump Stick while quantities last!